Scientists Stalk Cemeteries For Signs Of Wildlife Climate change has researchers looking for what they call "hidden habitats," where they can gather critical data on some of America's most endangered native plants and insects. One good place to look: graveyards. 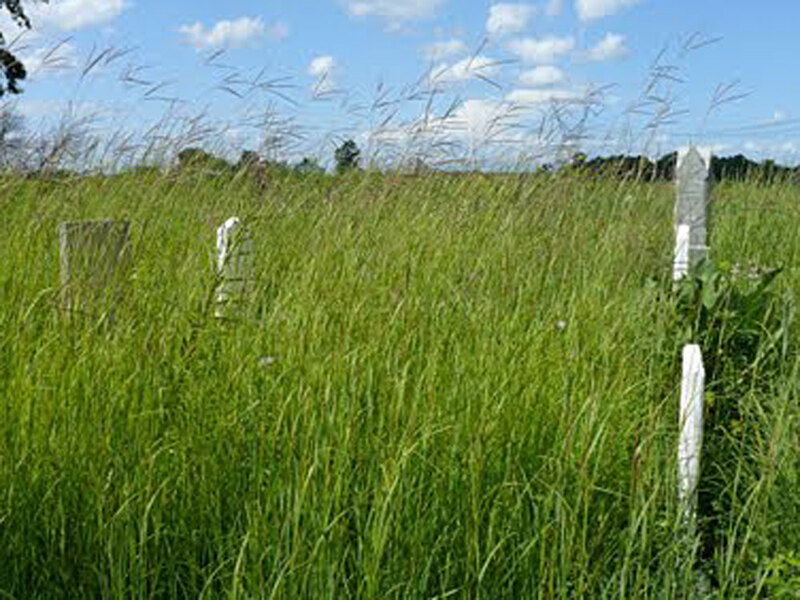 A cemetery in Ohio contains a fragment of "big blue stem" prairie. At the time of the Lewis & Clark expedition, these tall grasses rolled across much of the nation's undeveloped midsection. Across the U.S., development and agriculture have fundamentally altered the American landscape. In some cases, the change has been so dramatic that conservationists and researchers are now looking for what they call "hidden habitats." Among those are cemeteries that serve as refuges for some of America's most endangered native plants and insects. These sites are providing critical data on big issues, such as climate change and species diversity. When Lewis and Clark left St. Louis to explore the Louisiana Purchase in 1804, their journals describe the sight of wave upon wave of rolling prairie grass. One species in particular, called big blue stem, reached well above their heads and stretched as far as the eye could see. "It's a big grass that can grow 6 feet easily," says Erin Shank, an urban wildlife biologist with the Missouri Department of Conservation. "You would have seen it all the way from the Great Plains even into western Ohio, from Manitoba down to Texas." Shank is walking through Calvary Cemetery in north St. Louis, not far from the graves of famous locals — like Dred Scott and Tennessee Williams. The tombstones eventually give way to tall golden stalks of dried grass. "Essentially, the Archdiocese of St. Louis just hasn't gotten around to burying anybody here, so this has been pretty untouched," Shank says. The future of conservation is in fragments, unfortunately. We're working with private landowners and public land to try to best manage what we have left. These 13 acres, preserved by chance over 150 years ago, represent the last patch of native tall grass prairie in the St. Louis region. Shank says habitat remnants, like cemeteries, are becoming increasingly critical as sources of native plants and seeds. "The future of conservation is in fragments, unfortunately," Shank says. "We're working with private landowners and public land to try to best manage what we have left, down to small pieces that we just happen to be lucky, honestly, through history to still have intact." Despite cases like the Calvary prairie, many conservationists regard cemeteries as little more than "sacred lawns," without the same benefits as wild habitat. But in the Midwest, where agriculture has spread to nearly every corner, finding those natural areas is a challenge. "We spend a lot of time driving around, looking for these remnant forested areas and there are not a lot of them left," says Laura Burkle, an ecologist at Washington University in St. Louis. "It's really, really rare." With research partner Tiffany Knight, Burkle paid a visit to Moore Cemetery, a rural graveyard outside Carlinville, Ill.
A tiny island amid a sea of corn and soybeans, Moore is one of the few places where native plants and ground-nesting bees still thrive. Burkle points to a patch of bluebells and small white lilies. Just then she notices a low-flying bumblebee and charges with her insect net. "I think it's a queen," she says, having snagged her prey. "She is not psyched about being in here. All we want to do is identify her, and then we'll let her go." Knight says the big question they're trying to answer is whether the critical relationship between plants and bees is getting thrown off. "One of the things that we know is happening with climate change is that plants and pollinators are active earlier because it's warmer," Knight says. "The problem is that they might go out of sync — meaning the pollinators are active earlier than the plants are flowering." After recording the bumblebee's information, Knight releases the insect from the vial and moves on to a new spot. Although she's here to study flowers and bees, Knight appreciates the fact that cemeteries connect both — the history of humans and the landscape — into one complete story. Adam Allington reports for St. Louis Public Radio.